You are here: Home / Have You Been Wanting to Share Housing But Don’t Know How to Get Started? Have You Been Wanting to Share Housing But Don’t Know How to Get Started? 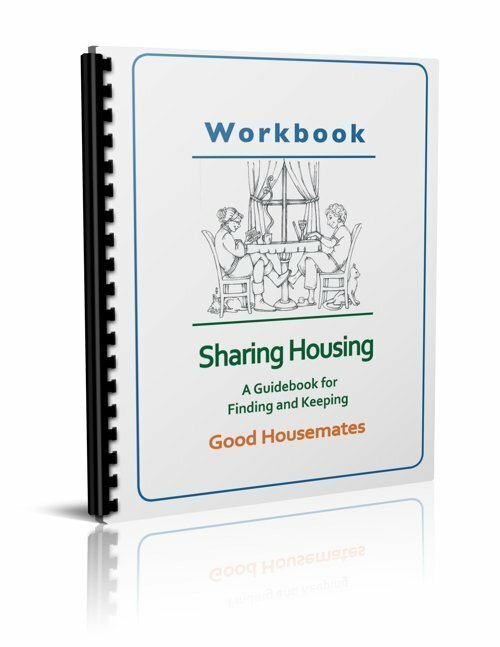 Sharing Housing: A Guidebook for Finding and Keeping Good Housemates will help you. It is full of tips, tools, interviews and stories from people who used to live alone and are now happily living with other people. These tools work for anyone looking to share housing, from college students to professional, empty nesters, seniors and more. As you read and use the workbook to reflect on your personal situation you will get clear on the steps. How to write an ad. How to negotiate the details of living together. What kinds of background checks and references are helpful. You will learn an easy-to-follow process that works with all types of shared housing, from short-term housing to long-term, to committed intentional communities. 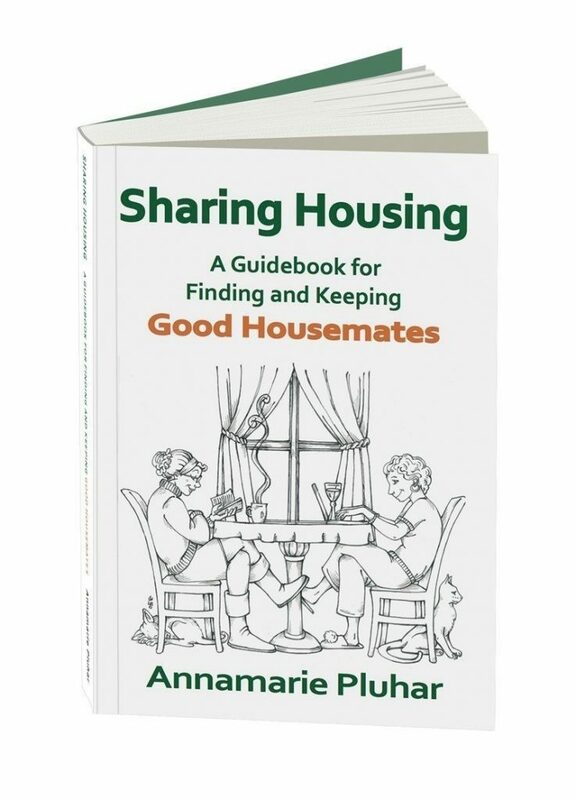 Order your copy of Sharing Housing today! At first the idea of a housemate seemed scary because one imagines all of the possible problems. Your book helped me prepare mentally by showing me how it could be done sensibly. I am a recently divorced boomer who had 30 years of accumulated stuff! I agree that making space for a housemate is crucial and that getting rid of stuff is emotional work. I felt so free once the Habitat for Humanity truck pulled away! I now had room in my life for more adventures. I put the word out to everyone I knew that I wanted a housemate and by word of mouth found another woman in my situation who was thrilled to find affordable rent in the Los Angeles area. We are having a ball because I used your techniques for describing my expectations for daily life and household habits. We knew we could be compatible because she had similar expectations. My housemate helps me afford the housing costs in LA so I can stay near my son after retirement. And it is so much more fun than living alone! The book and web site helped me a great deal. Your techniques gave me the confidence to begin and it has worked out beautifully. The companion workbook is for you to think, feel, and ponder how the information in the book is relevant to your situation and who you are. In the book, each chapter has a worksheet. You can use it in the book, but they are small. All the worksheets are reproduced in the workbook in a full-size format with a spiral binding so that you can write on them flat and you can keep your work together. In addition to the worksheets, there are checklists and tracking sheets for organizing your home-mate search. Keep all your notes in one place so that you can easily reference them. You can download all the worksheets individually if you’d prefer. This book is incredibly helpful to anyone thinking of living with housemates. It reviews all the details you could possibly use when thinking of living with other adults at any phase of your life. From the thinking of how to advertise for the right person, to sample ads which would let you screen for suitable people, Pluhar leaves no stone unturned in thinking of tips for someone who is new to living with strangers. She also manages to make completely readable guidelines for living together which might be extremely useful if someone had little experience in living in a shared home. Often, I see people who are not sure why their joint living arrangements have failed…or why others consider them “difficult” to live with. Introduction: Do You Want to Share Housing? If you are outside the United States, please contact us to make arrangements. Already have a copy of the book? Purchase the workbook by itself. If you have a discount coupon, enter it here. Please contact us for volume and nonprofit discounts. For other shipping options, please contact us using the form below. If for any reason you are not satisfied with the product, we will happily refund your purchase upon return of the items. If you live outside the United States, are looking for volume discounts, or have another question about obtaining the book or workbook please use this form to contact us.